I remember the moment like it was yesterday. My older son came home from a friend’s house where he’d had his first box brownie. When he told me about them, a rapturous kind of glaze came over his eyes and he told me they were the best brownies he had ever had. As a scratch baker, that was also the moment he crushed my soul. Heretofore, my specialty was saucepan brownies. I made them a few times a month. I thought they were pretty good, but my son’s reaction to box brownies gave me pause. Brownies are probably like pizza: It’s hard to make a bad one, but I’ll still eat it. I became determined to find the best brownie – either bakery-made or scratch – although, truth be told, brownies are probably like pizza: It’s hard to make a bad one, but I’ll still eat it. 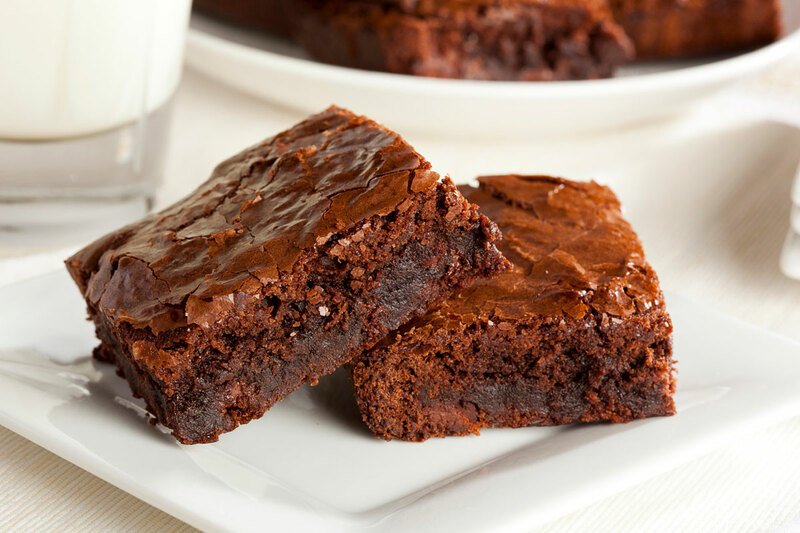 This pursuit may not seem like a high priority to many in these sometimes divisive times, but to me brownies are the quintessential comfort food that could be the thing to bring us all together – especially on National Brownie Day, Dec. 8. Brownies are classified as a bar cookie, but there is very little that is cookie about them. So what are they? I may not be able to define them, but I know them when I see them. I have tried many recipes and methods to create the perfect brownie. There is always something wrong with the recipes I try, so I figured I would leave the object of my quest in the hands of the professionals. Bakeries (or bake sales) have become my supplier. In the interest of science and to spare you unnecessary brownie sampling, I will tell you what makes a brownie bad: Overly fudgy brownies. Overly cakey brownies (because they are really chocolate cake posing as brownies). Nutty brownies. Brownies adulterated with weird fruity flavors (raspberry cheesecake brownies, I’m looking at you). Chewy brownies. Pre-packaged brownies that come wrapped in cellophane with no expiration date, and the frosting peels off in one piece. Brownies made with black beans. Brownies made with margarine. Brownie brittle, whatever that is. Brownies made with applesauce – can you imagine? The abomination known as blondies. And this might be sacrilegious, but edge brownies. And, of course, box brownies. I know it’s out there, somewhere. The perfect brownie is an ethereal, elusive combination of butter, melted chocolate, real sugar and flour, eggs, a pinch of salt and a hefty splash of Madagascar vanilla. Perhaps some chocolate chips could be invited to the batter party. And frosting – preferably made with chocolate and cream cheese; but sometimes just a light dusting of confectioner’s sugar would also be acceptable. The ultimate result would be midway between cakey and fudgey, about an inch thick and so satisfying that all I would need is one bite. The said brownie’s flavor and texture would also improve upon being chilled. I have been deceived many times. Occasionally, I have ascertained that the brownie that was posing as scratch was probably made from a box. The giveaway is the artificial taste. Maybe it’s only noticeable if you’ve never had a real brownie. Even box brownies know they are at a disadvantage when a simple internet search shows how to improve your box brownies. Is it possible, I wondered, that others have the same difficulty when making a brownie? Even box brownies know they are at a disadvantage when a simple internet search shows how to improve your box brownies. In a way, I kind of feel sorry for box brownies. With a little more refinement of their ingredients of cocoa, flour and sugar, they could have gone on to become a good version of scratch brownies. But somewhere along the way, they took a wrong turn and got involved with the wrong crowd: mono propylene glycol, distilled monoglycerides and artificial flavors. It’s not their fault. Perhaps you’re like my misguided son who has been swayed by box brownies or any of the other aberrations I mentioned above. I won’t judge. In this politically charged climate, I believe there is room for all dissenting opinions of the chocolate variety. I also believe that my perfect brownie is right around the corner (not the edge). Camille Dolan is the communications coordinator for the University of Central Florida’s College of Health Professions and Sciences. She can be reached at camille.dolan@ucf.edu. The UCF Forum is a weekly series of opinion columns presented by UCF Communications & Marketing. A new column is posted each Wednesday at http://today.ucf.edu and then broadcast between 7:50 and 8 a.m. Sunday on WUCF-FM (89.9). The columns are the opinions of the writers, who serve on the UCF Forum panel of faculty members, staffers and students for a year.